You are viewing the archived 2015 ratings for lawn mowers. Go to the current lawn mowers ratings. Think your lawn deserves a better quality cut? 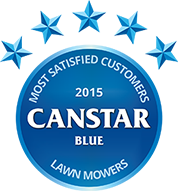 Compare lawn mower brands with our customer satisfaction ratings. For the second year in a row, Honda received the maximum five-star rating for overall customer satisfaction. It also earned top marks for reliability and performance, ease of start, grass-cutting quality, maintenance and after sales service. One man’s hobby is another man’s chore – and when it comes to mowing the lawn, Australians are evenly split between the lovers and the haters. Our survey of consumers, who have bought a new lawn mower in the last three years, found that 56% “enjoy” putting it to good use, which leaves 44% who obviously don’t. Men (59%) were only a little more likely than women (53%) to say they enjoy mowing the lawn, but that’s where the similarities end in the garden battle of the sexes. The majority of men who took part in the survey (72%) said mowing the lawn was a man’s job in their household and 51% of woman said the same. Perhaps some men see it as their duty to tackle the grass – like it may be to take out the trash or fix that wonky shelf – but women might not necessarily agree. That’s a debate for another day. But what most people can surely agree on is that to mow the lawn efficiently and effectively, it helps if you have a quality piece of kit. Because let’s face it, it’s the lawn mower that really does all the hard work and a man or woman is only as good as his or her tools. So in order to find out which lawn mower brand is up to the job of keeping Aussie lawns looking awesome, we’ve asked almost 600 consumers about the lawn mower they recently bought. And considering 30% of them admitted their lawn often becomes overgrown to the point where it’s difficult to mow, they’re well-placed to judge! Survey respondents reported an average spend of $531 on their lawn mowers and most brands scored favorably in regards to performance and value for money. However, for the second year in a row, Honda out-scored the rest for overall customer satisfaction. It was also the only brand to earn top marks for grass-cutting quality. When it comes to major purchases, it’s not uncommon that the importance of getting value for money doesn’t register as a significant driver of satisfaction. However, this does seem to be an exceptional outcome and emphasises that consumers don’t mind paying a premium price for a new lawn mower – provided it lives up to expectations. Honda is a name synonymous with power and its outdoor power equipment is no exception. It boasts a range of lawn mowers, brushcutters, hedgecutters, blowers and “versatools”. Honda’s lawn mower collection is broken down into three categories – domestic, premium domestic and commercial, which include both petrol and electric mowers. They start with the HRE370 electric mower which Honda says combines its technology and famous reliability in the lightest possible design. It describes the mower as “an integral part of the suburban cowboy’s backyard arsenal” and it has a recommend retail price of $399. From there, Honda’s mowers get bigger and more powerful, right up to its premium commercial machines costing more than $1,700. Black & Decker is a household name in DIY power tools – its product range includes corded and cordless drills, saws, sanders, grinders and, of course, numerous garden tools like lawn mowers, blowers and trimmers. Pride of Black & Decker’s lawn mower collection is the Edge-Max – an electric mower which promises the closest edge cutting and to collect 30% more grass for less time spent emptying. Masport is a well-known brand in the world of outdoor power and leisure equipment, such as barbeques, patio heaters, shredders, edgers and lawn mowers. Masport says its lawn mowers have been designed to meet the needs of the heaviest lawn conditions and the longest mowing times – therefore they are “built to last”. It says the range features rich, innovative and “truly high performance” mowers, which include the President range, Silver Series and other petrol models. Victa is a well-known producer of lawncare products and claims to be “Australia’s favourite mower”. It says it has earned a reputation for innovation, strong performance and rock-solid reliability. Victa believes its mowers meet the demands of a changing climate and increasingly diverse lifestyle. Its produce ranges encompasses “easy-to-use” two and four strike powered petrol mowers, mains electric and battery mowers. The brand also boasts trimmers, blowers and a range of accessories to complement its bigger products. Rover says it offers a large range of easy-starting walk behind movers that give “an amazing finish”. It also provides a range of durable ride-on mowers for those with larger areas to take care of. Rover insists its brand success reflects its “high efficiency grass catching and mulching designs and an enviable reputation for product reliability”. No job is too big or small for Rover, it says. Canstar Blue commissions Colmar Brunton to regularly survey 3,000 Australian consumers across a range of categories to measure and track customer satisfaction. The outcomes reported are the results from customers within the survey group who have purchased a petrol lawn mower in the last three years – in this case, 597 people.